How does mind fit into nature? Philosophy has long been concerned with this question. No contemporary philosopher has done more to clarify it than Jaegwon Kim, a distinguished analytic philosopher specializing in metaphysics and philosophy of mind. With new contributions from an outstanding line-up of eminent scholars, this volume focuses on issues raised in Kim's work. 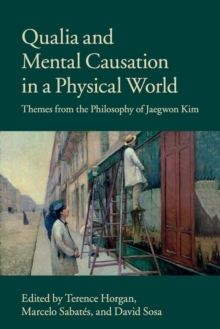 The chapters cluster around two themes: first, exclusion, supervenience, and reduction, with attention to the causal exclusion argument for which Kim is widely celebrated; and second, phenomenal consciousness and qualia, with attention to the prospects for a functionalist account of the mental. This volume is sure to become a major focus of attention and research in the disciplines of metaphysics and philosophy of mind.